The tattoos of ancient peoples will never go out of style. This reverence for old people is not new and is gaining more adherents in the world of tattoo. On this occasion, we see a quite original Aztec design. 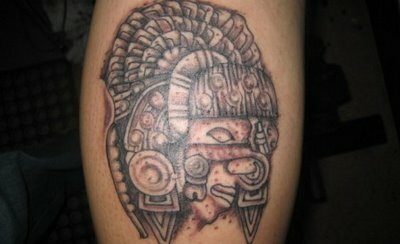 When choosing a tattoo Aztec or some other ancient people know that the chosen design saves a great significance is often not fully understood. Many people choose a reason for aesthetics only, losing some of the charm to wear a tattoo like this. The Aztecs were very advanced, especially with regard to Art. With great knowledge of architecture, drawing and painting, have left a huge legacy charged with magical symbols to learn. The tattoos were an important part of Aztec culture. Aztec tattoos can be found almost anywhere that represent the life of this people, their beliefs, gods, activities, etc. Choose the most suitable according to our tastes can be difficult but surely getting to know the meanings find the most appropriate for you.